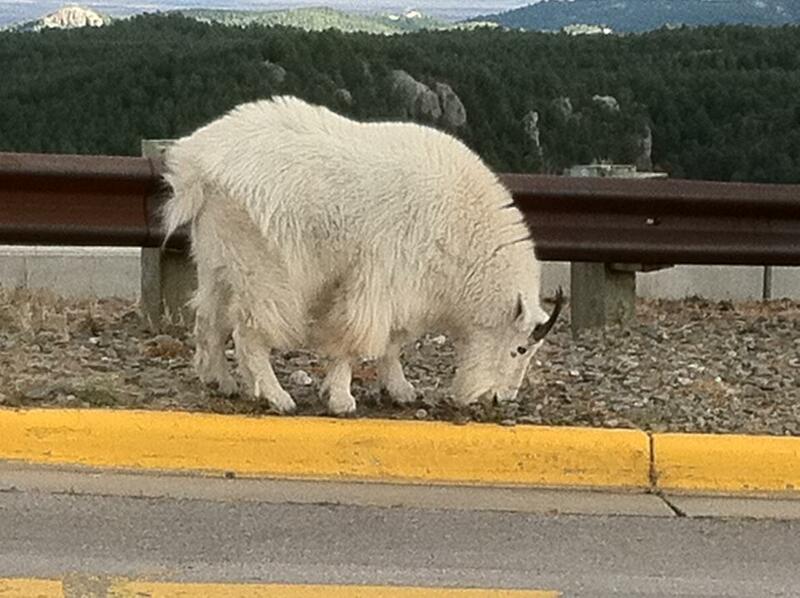 Are you kidding me we finally see a mountain goat here???? I watched a PBS DVD about Steve Jobs tonite and then followed it up with Soul Surfer about the surfer Bethany Hamilton that had her arm bit off by a shark in Kauai, Hawaii. Thank you to my friend Dan Brannan for recommending Soul Surfer. And it was interesting how my view of “failure” was transformed by these two totally unrelated people. Of course in my mind we are all related so this was more than a happy accident. In the PBS special they talk about how Steve Jobs, who by the way, became a millionaire by the time he was 21 and multimillionaire by 23, and a billionaire by 29, through his creation with Steve Wozniak – Apple. He found himself being forced out of his company in his 30’s, he angrily divested himself of all his stock from his own company. As a business owner myself I cannot imagine the sense of betrayal he must have felt. He then came back years later and not only return the company to its original glory but took it far beyond. Several of the people close to Steve Jobs said he would not have been able to come back and make Apple what it is today had it not been for his “failure”. I am thinking really that’s a failure, but to him at that point and time I am sure it felt like a failure. I am sure not too many people can argue against the fact that Steve Jobs changed the way we live. Whether you use his products or not his impact reaches almost all of us. But in reality had he not gone back to Apple during its most dismal days it’s hard to imagine how the course of current events would have changed. What is really amazing is that he could have easily faded off, still a rich man, and settled in to a comfortable life. Instead he faced this enormous challenge and succeeded. Even in his last days while battling cancer his friends shared he was still the driven creative genius, looking toward the future. Amazing. So on to my second source of inspiration, Bethany Hamilton, she was on the verge of becoming a professional surfer when a shark attack left her an amputee. She desperately wanted to return to surfing and starting trying only a month after the attack. At first she was not successful and in her eyes at first had failed. However, watching this amazing girl trying to overcome her challenges was in no way a failure, and she began to realize that too. Her famous quote in the movie “I don’t need easy, I just need possible.” She went on later after considerable hard work and sheer will power to place in her next competition. She showed such grace and strength through it all. After watching both of these stories I really reflected on how I tend to think about all or nothing. And thank goodness Steve Jobs and Bethany Hamilton did not think that way. It’s so easy to get discouraged if things do not turn out the way we think they should. We have an idea of how things are supposed to be and we rigidly cling to that illusion, which is what it is, an illusion, it’s not reality, what is actually happening IS reality. I went to lunch last week and ordered steamed vegetable rice when the order came it was vegetable soup. At first I told them that was not what I ordered. And almost instantly a little voice said that sounds better than what you ordered. So I told the waiter I would take the soup and it was delicious and actually healthier for me. It’s a small thing but we have many of these “happy accidents” everyday. And we can view them as failures or we can view them as an opportunity. I am practicing in my daily life to be more present to these “little” things and welcome these happy accidents rather than viewing them as failures. We all have thousands of these happy accidents and opportunities to be more present to what is really going on around us. Is this a failure or are we being nudged in a new direction or perhaps being taught a valuable lesson we will need later? If you think about it from that perspective it changes how you feels about these incidents. My brother recently went to the Keys the beginning of his trip was rough, his initial flight out of St. Louis was cancelled. He was totally upset and called me to see if I could help him find other flights and of course being the supportive older sister I first asked do you have your goslings? See my brother drinks Gray Goose and he calls those mini bottles of Gray Goose his goslings. He confirmed he did, I told him to have one of his goslings and enjoy the adventure. Because basically I could not help him find any other flights on companion airlines. He was supposed to fly direct to Key West but ended up flying to Miami via Cincinnati and had to rent a car to get to his destination. He was totally upset at first however; after a few WKRP in Cincinnati jokes and a gosling or two later he said in the end that was the best drive he has ever taken. So again what could be viewed as a failure really was an incredible opportunity to enhance his trip. Another happy accident, I took a friend to visit Mount Rushmore in my home state, she had never been to South Dakota before. I really wanted her to see the beautiful mountain goats that graze around the hills at Mt. Rushmore. So we drove along the highway and initially passed the monument to see the places I usually see the goats, after all I was on a mission. None was to be found in all the usual places, dejected, I gave up and headed into the monument parking lot and after I paid to enter the woman in the booth said, “oh and on your right you will see some mountain goats as you enter.” So I look to my right as I pull ahead and there right next to the ticket booth were a family of goats. It is the closest I have ever been to them before it was absolutely amazing. So again I thought I failed when in fact success was right around the corner unbeknownst to me. My natural tendency is to see things as an either/or proposition, you know black or white, and I am dancing in the shades of gray more and more. It has opened up a whole new world. Steve Jobs and Bethany Hamilton definitely see the “both/and” of things. Steve Jobs asked Bill Gates the founder of Microsoft and his corporate rival to help him finance the resurgence of Apple. Just think about it, how many people would have the gumption to ask such a thing of their rival. Would Pepsi finance Coke if it were failing or vice versa, I realize not exactly the same thing but still it’s a tall order. Bethany Hamilton after losing her arm volunteered on a mission trip to help the people in Thailand after the tsunami. Specifically to help the children overcome their fear of the ocean. First of all how many parents out there would feel comfortable with letting your daughter go after such a traumatic injury. Secondly, how about Bethany, helping others overcome their fear of the ocean??? Again, they are both amazing people for very different reasons and in very different ways. It is also no accident that I watched both these movies and saw the message I did. I am currently going through a major transition in my life not anything as public or traumatic as the stories I have shared, but to me the emotions are just as real. So the next time you have it in your mind that you want something to be or go a certain way and it does not, remember it may not be life laughing in your face, but nudging you in a direction more aligned with your divine purpose. Posted on March 4, 2012, in Spiritual Journey and tagged Apple, Bethany Hamilton, Dan Brannan, divine, divine purpose, failed, failure, Hawaii, Kauai, Mount Rushmore, mountain goat, mountain goats, Mt. Rushmore, ontological, ontological coach, purpose, shark attack, Soul Surfer, Steve Jobs. Bookmark the permalink. 1 Comment. Really — no really – i love you my sister!